Welcome to Day 2 of 12 Days of YEA Camp Heroes! Our 12 Days of YEA Camp Heroes is part of our end-of-year fundraising campaign, If Not for YEA Camp… When you donate to YEA Camp, your generous contribution enables youth activists to develop the skills, confidence and community they need to make a difference. YEA Camper Joyce from New Jersey has been on fire since camp and is a huge inspiration to us! Joyce came to YEA Camp because she was committed to addressing bullying and trying to create a safe climate at her school. She was honored when her teachers chose her to be one of the school’s peer mediators, and she was enthusiastic for the training she received. Since YEA Camp she’s taken her efforts much further — to address bullying and beyond. 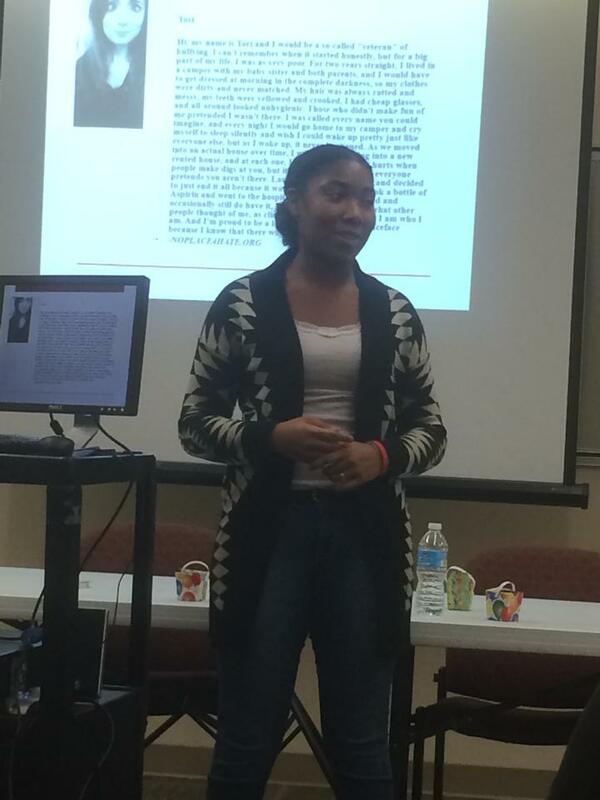 overcame her nerves and gave presentations in classes at her school about the impact of bullying. initiated “Mix It Up” Day successfully at her school, where students sit with different people in the cafeteria for the day than they usually do. created a bullying awareness social media account. Did we mention that Joyce is 14? 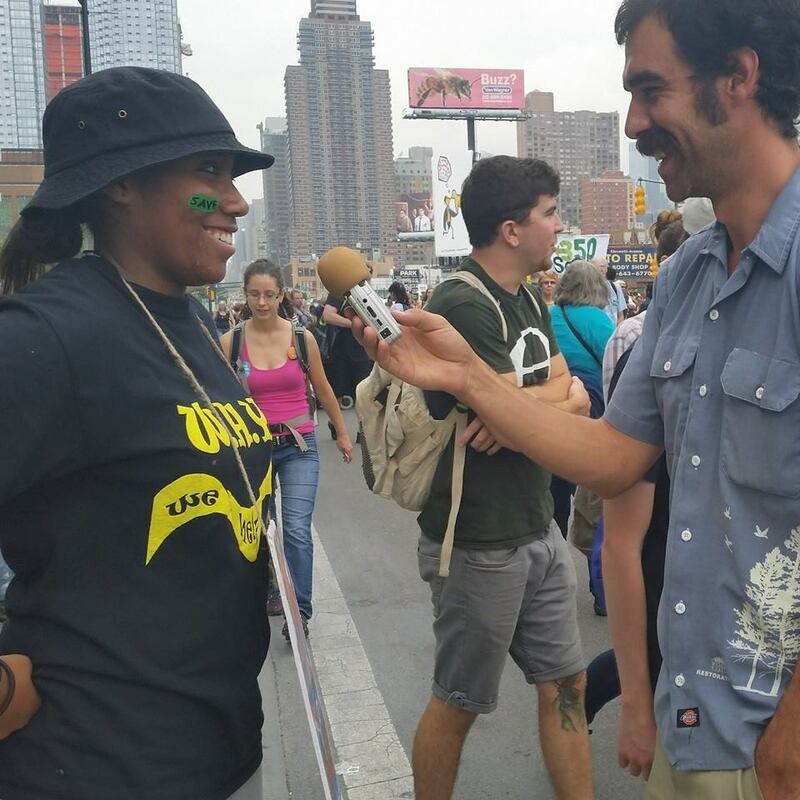 Joyce giving a radio interview at the People’s Climate March. 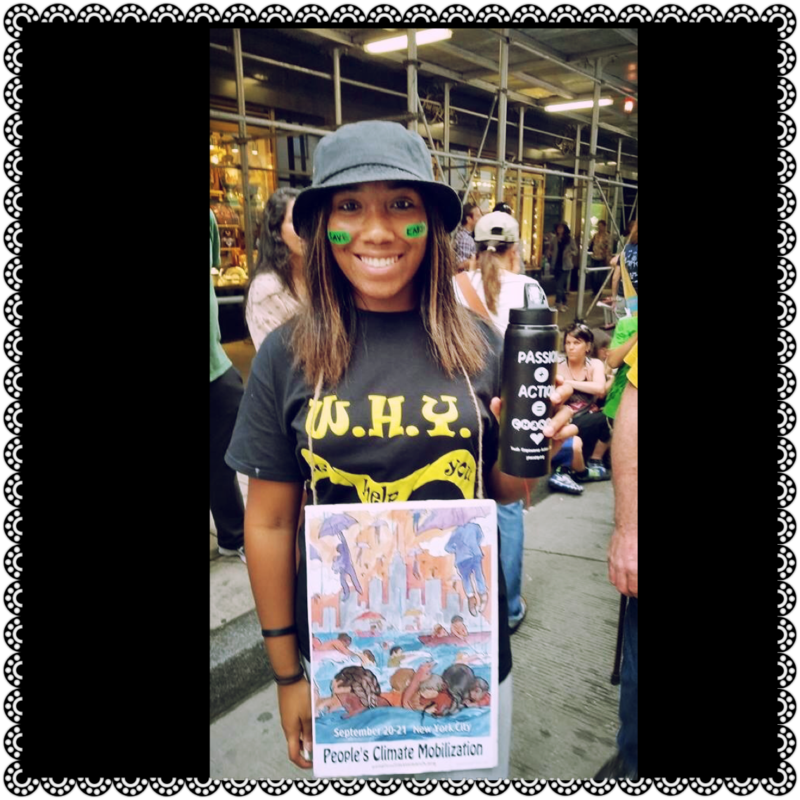 Joyce found out about the upcoming People’s Climate March in New York at camp when another camper invited people to attend, and so this October Joyce went to her first ever rally. She brought her mom along with her, and had a great experience that included being interviewed by this journalist, as well as by us in this interview. Joyce organized a successful food and clothing drive at her school. Joyce served food to the homeless on Thanksgiving, has passed out leaflets about important causes, and even became a vegetarian. Joyce is a dedicated member of YEA Camp’s Youth Advisory Board, giving her time and energies to help YEA Camp when we need it and to support other campers in their own efforts to make a difference. We actually disagree. We’re sure someone as compassionate, smart, kind, and dedicated as Joyce would be doing great things without YEA Camp, but with the skills she learned, as well as the knowledge, community and confidence she developed at YEA Camp, we are thrilled that Joyce is taking her passions to new heights, and this is just the beginning! As 2014 comes to a close and are already getting scholarship requests for this summer, we recognize the power your donation has to help young people like Joyce pursue their passion to make our world a better place. Your donation to YEA Camp enable campers like Joyce to speak out about important causes, to make changes in their school and communities, and to influence their peers. How much is that worth? You can contribute here and know you are getting a great return on your investment. Tune in tomorrow for Day 3 of 12 Days of YEA Camp Heroes! If you missed Day 1, check it out here. P.S. Inspired to attend YEA Camp yourself, or to tell another teen about it? Take advantage of our YEA Camp 2015 early bird pricing by reserving your spot now. Youth Empowered Action (YEA) Camp is a summer camp for social change. Our life-changing leadership camp trains 12-17 year-olds to make a difference on a cause they care about. Since 2009, our weeklong overnight camps have helped more than 500 teens from all over the country get active in their community or school on causes like climate change, racism, LGBTQ rights, animal rights, bullying and more. Find out more and register to join us at www.yeacamp.org. This entry was posted in Uncategorized, youth activism, Youth Empowered Action. Bookmark the permalink.